Insert Molding, by Joe Vest, Vice President of Bright Plastics. Published in September/October issue of Medical Design Technology. Insert over-molding or metal over-molding can reduce the labor and assembly costs in plastic part manufacturing, while improving a product's strength and wear resistance as well. This look at the technique provides an overview of its advantages, disadvantages, and its effects on cost, product quality and safety. Plastics processors around the country are concerned about where they're going to find the next generation of skilled workers. Too often, this can mean looking for someone to blame - public schools, community colleges, families, politicians. In North Carolina, some processors are taking responsibility and doing something about the problem. Plastics News put the spotlight on two efforts in North Carolina last month. Joe Vest and Doug Tichy, Bright Plastics' Vice President and Medical Manager, respectively, contribute to Lisa Lupo's Integrated Nation – A Special Report on Cleanroom Equipment in the March, 2016 issue of Plastics Machinery. Customers are pushing manufacturers to innovate and evolve, contributing to changes in clean-room equipment. The rise in robots and automation is the most significant of a number of equipment trends, say some industry leaders. 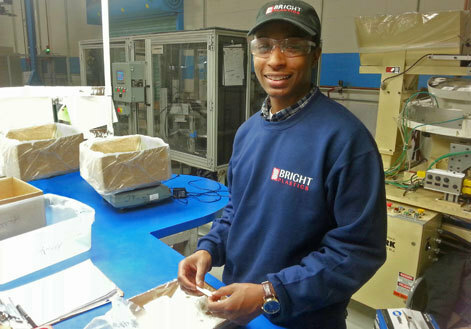 Bright Plastics, a custom injection molding company, is a proud participant in the [GAPNC] Guilford Apprenticeship Partners initiative. Led by several local business partners, GAP is sponsored by the Triad Workforce Solutions Collaborative and the Greensboro Partnership. GAP offers local high school students apprenticeship programs with manufacturing companies in the area. Bright Plastics, Inc.- a custom injection molding company - has improved a hatch system for Confluence Outdoor, maker of kayaks, canoes and related accessories. The design was modified and new tooling was custom-built for their Orbix™ hatch system. The hatch now includes a molded-in rubber seal - with a tighter tolerance than a rubber gasket - to prevent leaking while the kayak is in use.